Forgiveness is the story of August, an inmate on the island-prison of Asylum. He and his fellow prisoners are criminals banished from a utopian world. In the mainland society, morality and joy are the only laws. The peoples of this culture want their criminals to be spared any feelings of guilt or regret during their lifetime sentences. As a result, August is constantly injected with a drug ironically named Forgiveness, which clouds his memory and forces an optimistic grin. However, some lives are too powerful to be forgotten, and August finds himself plagued by memories of his past and crime. As he slowly frees himself from the tyranny of Forgiveness, he must hide his lucidity from the guards and the ever-vigilant Dr. Rictum. But could the truth of Augusts’ past be worse than he imagines? Could some crimes be too evil to be forgiven? Will August reach forgiveness? Liam North, the author of ‘Forgiveness’, has kindly agreed to play tour guide inside the halls of Asylum and into the depths of Augusts’ mind. Liam, what sparked the struggles that we witness in ‘Forgiveness’? The idea for Forgiveness actually originated with an alternative indie song called Sertraline by Racing Glaciers. For the first dozen times I listened to it, no story stood out to me. But once I focused on the lyrics, I found an interesting concept beneath them. The song wonders whether the use of drugs to avoid pain and regret is a wise option; if it is, would we still be ourselves when the damage is done? Perhaps our agony helps make us who we are. Perhaps killing it would kill us, as well. What really caught my attention in these lyrics, however, was the stance of the singer. From the lyrics near the end of the song, it seemed as though he is being forced to take these drugs, forced to forget his struggles, and yet pleads to have them back. A man begging to feel his own pain once more – that was an idea worth exploring! From this perspective, the general mood of the vocals, and the structure of the song, Forgiveness was born. In almost every aspect of Forgiveness, an origin can be found in Sertraline. I haven’t heard Sertraline or the work by the Racing Glaciers, but if they can inspire such an in-depth exploration of pain I will have to check them out. On a cursory glance, it appears that August is the man in the song who looking for the return of his pain. Was this the only fuel for his character? When analysing August, many of his characteristics can be traced back to the song’s lyrics. However, I also drew on my childhood to flesh-out his qualities. August is a very timid, gentle creature. As a young boy, I would have been described as such. I have since, admittedly, become a bit more intense and high-strung, but recognizing myself in August’s personality helped me to write him believably. He truly is a boy bearing a man’s guilt. August is facing a huge emotional challenge to work through his guilt and pain during his lucidity, and no doubt readers will be caught up in the emotions of the situation. If you could reduce this emotional overload for your audience, what single point do you hope they take from ‘Forgiveness’? If a single idea or theme could be distilled from Forgiveness, it would be that pain defines us. One of the questions the story asks is if we should have a painless world? Obviously, this contains substantial philosophical and theological implications, and many people today are of the position that pain is a plague. I, however, believe that there is a beauty in pain. After all, is pain not as necessary for joy as darkness is for light? How would we know light if we did not know its absence? How would we appreciate peace if we did not know war? I would argue that within negative emotion and negative experience, we find something of ourselves. I think a perfect world is sterilizing, and I think this is what August faces in Forgiveness. I think this is what I have attempted to say through him. August really has faced a huge spectrum of complexity through his journey in Forgiveness. Can readers expect to see the return of August in another novel, or have you decided to turn your mind towards other tribulations of our time? I am currently writing a novella titled Smog. It deals with concepts like greed, the tragedy of the commons, optimism and pessimism, the insufficiency of material pursuits, and finding meaning in a dying world. While Forgiveness dabbled in the darker side of humanity, it remained somewhat brighter due to its hopeful and timid protagonist. However, Smog will plunge into the mind of a man who has seen the depths of corruption and tragedy but lost his hope along the way. To me, it sounds like Smog is another exploration of the darkness of our time. I have no doubt that it will be one fascinating read. What is it about writing that keeps drawing you back in to explore concepts like those in Smog or Forgiveness and capture your thoughts on paper? All my life, I have been enthralled by stories. They remain our most effective method of capturing and distilling human experience. After all, life is narrative, and I feel most alive when inventing my own narratives. As a result, I find myself surrounded by stories desperate to be told. One of my greatest fears is failing to write these stories down, to cement them in a reality external to my mind, to give them breath distinct from my own. I feel that it is my duty – the duty of all writers – to etch my narratives in stone for others to experience. To neglect this duty would be a personal crime. It’s obvious that you take your duty very seriously. How do you approach each new project so that you can ensure that you aren’t committing a personal crime? Whenever I begin pursuing a new story, it undergoes an intensive plotting process. Not a single word of the first draft is written until every chapter, from start to finish, is laid out and prepared. While many fellow writers I know prefer to let the story chart its own path, I feel that a thorough story plan is the most effective method to write any narrative longer than fifty pages. Knowing the conclusion of the story allows me to foreshadow, plant, and point from the very first chapter – in my opinion, one of the most important factors in a rich, complex work. Furthermore, a rigorous planning phase reduces the amount of editing awaiting me after the first draft. Most plot holes and lacking story points are filled before “pen meets paper,” as it were. I haven’t interviewed any authors recently that maintain such a rigorous approach to planning, but I completely agree that prior planning would significantly reduce the toils of editing. After the plan has been prepared and approved, what does your writing process look like? I began writing when I was sixteen years old, and, with the exception of weekends and illnesses, I have written every day since. At first, I wrote for thirty minutes a day, then an hour, then two hours, until I maxed out at seven hours. Those hours have shifted over time to allow space for other responsibilities, but my productivity is owed entirely to this daily commitment. That is an impressive commitment to your craft. Thank you for sharing this progression as it highlights that even someone who has never written before in their life could take up the craft with a little care and commitment. Sadly, we’ve run out of time today, but can you leave our audience with your favourite line from your commitment to ‘Forgiveness’. Liam, thank you for sharing the scent of roses from within the pages of ‘Forgiveness’, and I wish you the best of luck with your current project ‘Smog’. Excited to read the book we discussed today? Find it here on Amazon: ‘Forgiveness ( ASIN: B0745G7WDF )‘. 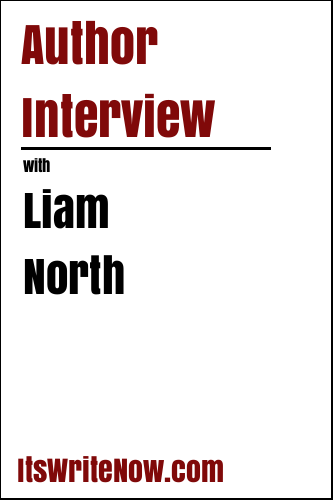 Want to find out more about Liam North? Connect here!